Our Sinclair DNA project currently shows 4 Lineages who have tested positive for the U106 SNP or some of the downstream SNPs. As you can see from the chart below, there are lots of SNPs "downstream" of U106. The U106* Lineage - That asterisk means that, while there are SNPs downstream to test for, the participants currently have tested negative for all available to date. We currently have 2 confirmed members of our study who show this SNP. The Z9* Earldom Participant - This gentleman has a Burkes Peerage confirmed paper trail that supposedly connects him to our Earl of Caithness. He currently has no other matches in the entire FTDNA database, including the St. Clair famly. This makes sense if you consider this line's proclivity for having female children. 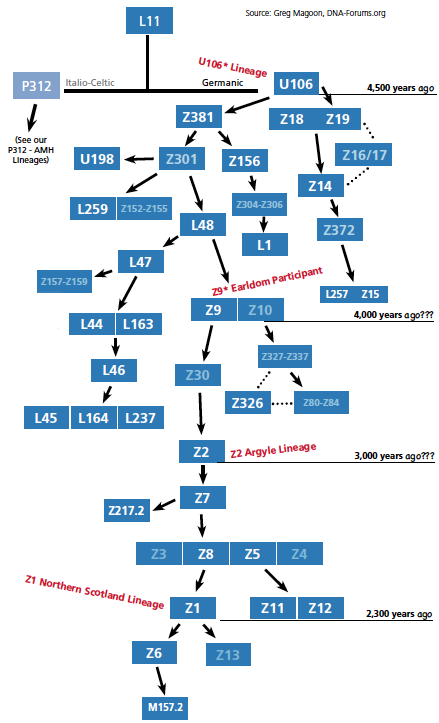 Our Z2 Argyle Lineage - We've tested 3 different Sinclair DNA study members who have very good documents back to Argyle. 8 of these members are tested out to 67-markers. Even the participants who have the greatest genetic distance (all 3 proven Z2+ via SNP testing) show up as sharing a common ancestor about 540 years ago with FTDNA's TiP Calculator. There are 12 members of this lineage tested out to 37-markers. Again, at 37-markers, the TiP calculator still shows about 540 years to a common ancestor. Our Z1 Northern Scotland Lineage - We currently have 7 members who have been confirmed Z1+ via SNP testing. There are currently 17 members of the Sinclair DNA study who have tested out to 67-markers. The same number shows up at the 37-marker level. Using FTDNA's TiP Calculator, those furtherest from each other in genetic distance in this Lineage show a common ancestor about 600 years ago.